I love Citrus smell in anything and everything - I feel it makes me fresh and active. 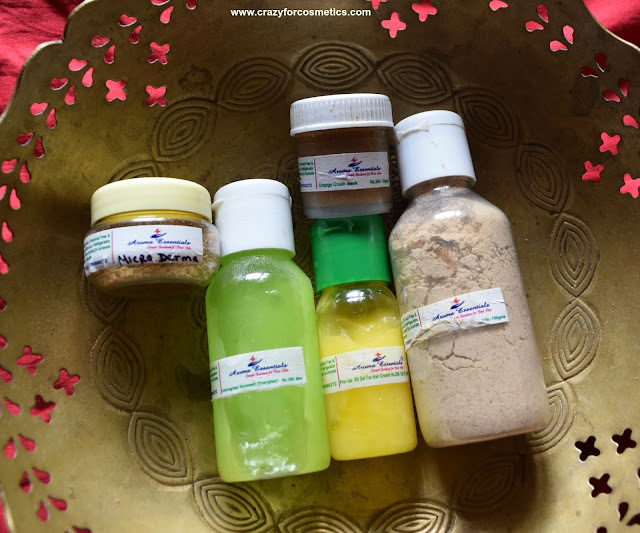 I happened to try this face wash that contains lemongrass from the brand called Aroma Essentials which is 100 % natural products made by Madhurima who resides in Bangalore. She was kind enough to send a whole set of skincare products for trying them out. All our products are freshly handmade in small batches using the finest natural ingredients.we do not use harsh chemicals like petroleum or mineral oil.the color and scent of our products occur naturally from our ingredients and essential oils.No artificial colors and scents are added.store in a cool dry place away from sunlight. The Micro derma product has been doing wonders on my skin. The product catalog has great products for all your skin needs. Do check it out on her facebook page. 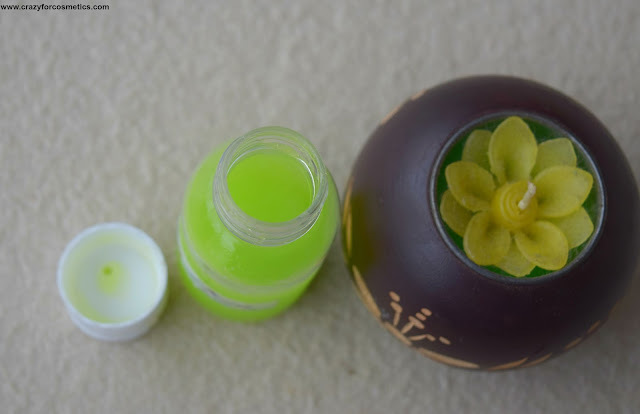 Energizes the skin cells and washes away toxins accumulated in the skin. Wet face, apply the face wash all over, massage & wash it off. Aroma Essentials products are 100 % natural. They are to be stored in the refrigerator for long lasting effects. 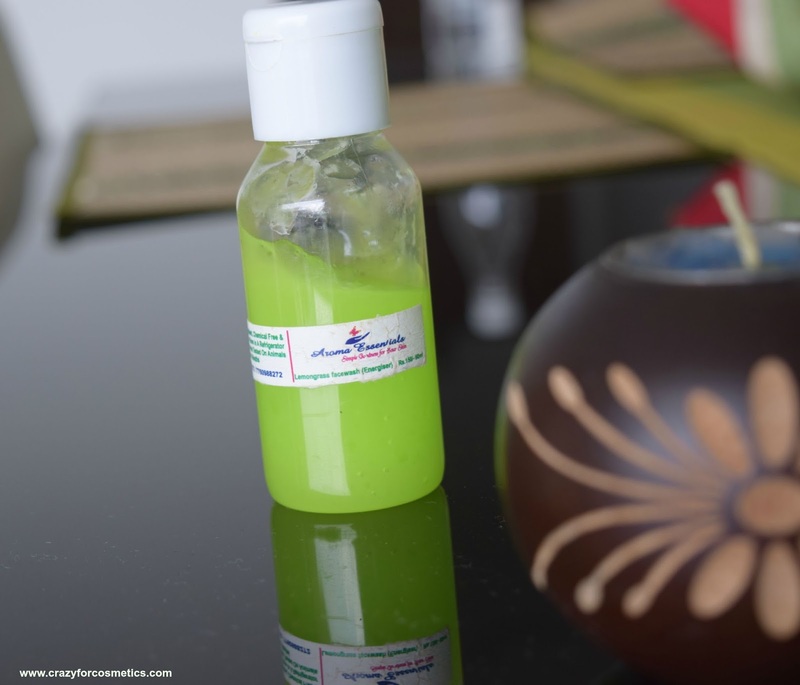 The Aroma Essentials Lemongrass face wash comes in a plastic bottle with a firm lid. The face wash needs to be squeezed out of the bottle. The bottle is transparent and you can know how much of it is still left. Very lightweight packaging and convenient to use. The only con I felt was that it had just the name printed and stuck on it and not much of product details printed on the bottle. The usage instructions were sent to me over phone. Madhurima has however ensured that her packaging is undergoing a revamp and it would get better. The Lemongrass face wash contains Lavender & Lemongrass essential oils which is extremely good for your skin. It does not cause any side effects on the skin. 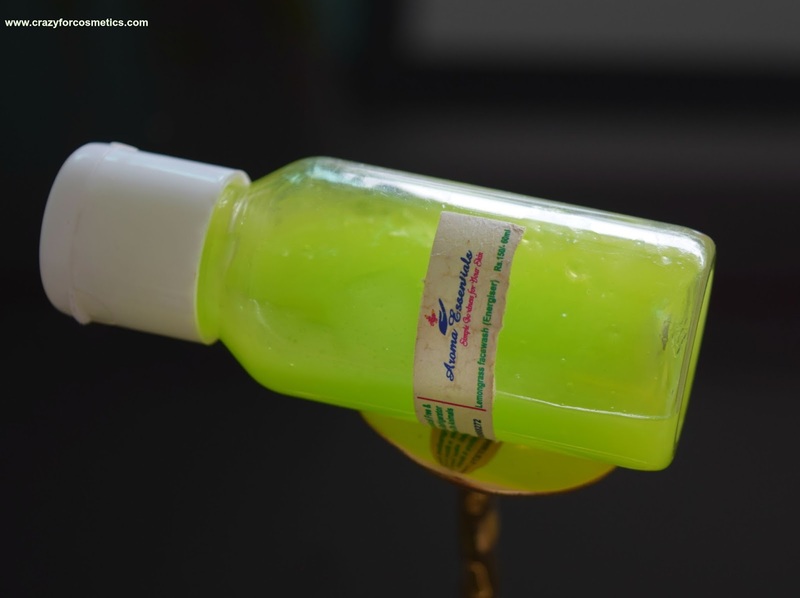 The Aroma Essentials face wash smells heavenly so much like lemongrass that it freshens me in the morning.The face wash comes in a bright , fresh green color that looks quite similar to aloevera gel.The face wash does not lather at all and it has gel like consistency since it is 100 % free of chemicals. I prefer using it in the morning , when I wake up so that it would remove all the oil from my face and freshen me up for the day. 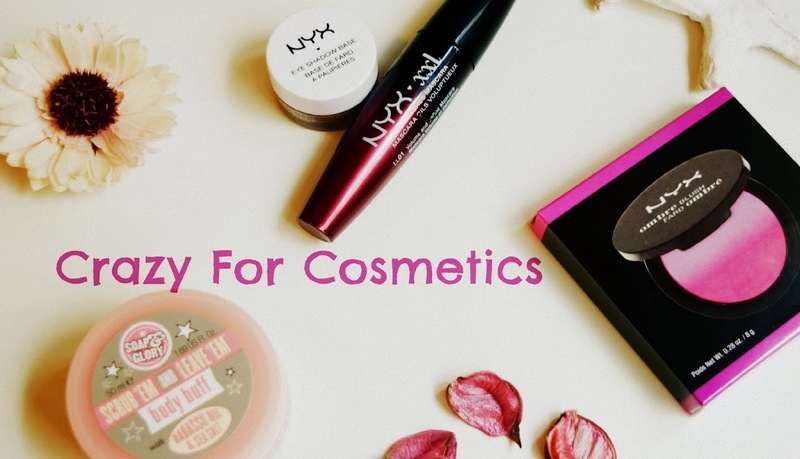 It cannot be used to remove excessive dirt or makeup since it is very mild on your skin. A small drop of the product is enough for one wash and it lasts about 1.5 months when used for about 4 days in a week. 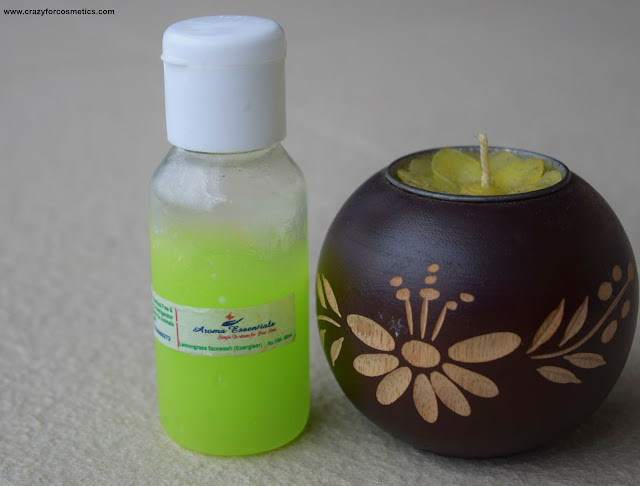 Price of Lemongrass Face Wash ; INR 150 for 60 ml. Coming to the pricing, I feel it is a bit expensive for the quantity but seeing that it is 100 % natural and contains real essential oils , it is worth the cost. The face wash acts as a good energizer as claimed but can surely not be used to clear up toxins after a long day because it works more a gel. 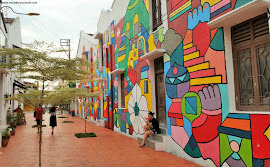 1 : The products are made on a personal basis after a small consultation over phone. 2 : Neat shipping & packaging. 3 : The face wash makes you really fresh. 4 : A small quantity goes a long way. 5 : International shipping is being done to few countries. 6 : She plans to revamp the packaging with more details on the product itself. 1 : It does not lather at all. Next in the Aroma Essentials list,I would be reviewing the Micro Derma product which I am really impressed with and has done wonders for my skin. So stay tuned. *PR sample, but review is true to the best of my knowledge.